Two Pd-Cu alloy membrane modules were designed to recover high-purity hydrogen from a mixture at elevated temperature and pressure. Permeation and separation behavior were studied experimentally and theoretically using pure hydrogen gas and a binary mixture of H2/CO2 (58.2: 41.8 in vol%) at 250–350 °C and 800–1,200 kPa. The Pd-Cu membrane modules presented a maximum permeation flux at the highest temperature (350 °C) and pressure (1,200 kPa) both for pure H2 gas and the binary mixture. When the permeate and retentate flowed in the same direction in the membrane module (co-current flow), a temperature gradient and permeation flux variations were observed and the permeance of the H2/CO2 mixture was 2.263×10−4 mL/(cm2·s·Pa0.5) at 250 °C and 3.409×10−4 mL/(cm2·s·Pa0.5) at 350 °C. On the other hand, when the retentate flowed in the opposite direction to the permeate flow (counter-current flow), the temperature gradient and permeation flux variations were significantly reduced and the permeation flux improved by about 11% from that of the co-current flow module. The well-distributed temperature profile inside the module and increased hydrogen pressure difference through the membrane layer shortened the time to reach the steady state in the counter-current Pd-Cu membrane module, thus enhancing the membrane performance. 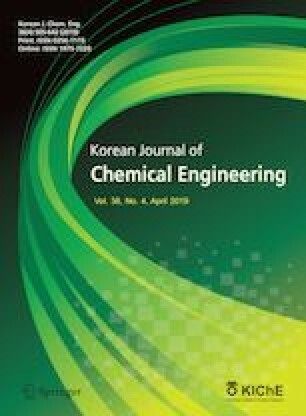 The results of this study can contribute towards developing an efficient Pd-Cu membrane reactor.